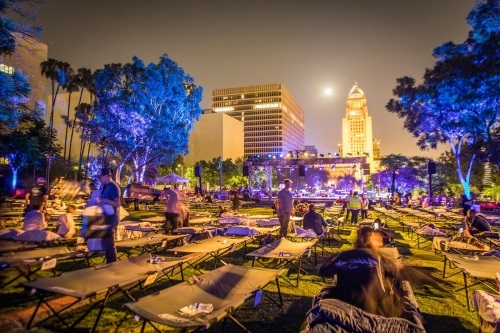 Immersive technology deployed for lullaby performance through the night in downtown LA’s Grand Park and eclectic festival in the English countryside. On a weekend when Mars traversed the Moon, the d&b Soundscape from d&b audiotechnik delivered other worldly sound, transferring listening experiences for audiences whether wide awake or fast asleep. Following a successful stint at the Klassik am Odeonsplatz open air classical music festival in Munich, the d&b Soundscape spanned both the globe and a universe of musical styles. While Max Richter performed Sleep in Los Angeles, the WOMAD Festival took place in an unusually sun bleached English countryside looking more like Southern California. This was Max Richter’s first outdoor and largest performance of Sleep, a lullaby performance that runs right through the night. Under the Moon, and stars, the piece had the audience safely tucked up in bed in downtown LA’s Grand Park for a performance of the score for piano, strings, and voice by Max Richter with members of the American Contemporary Music Ensemble. Chris Watson’s Riding the Silver Tide project at WOMAD. By an uncanny coincidence, just as the audience in LA were about to climb from their beds in the park, across the world the WOMAD afternoon audience were taking a horizontal position and bedding down on the floor of the d&b Soundscape stage. They were being enveloped by Chris Watson’s Riding the Silver Tide project, recordings he’s made of the dawn chorus as summer daybreak filters down Britain, from the far north of Scotland to the far south west of England. 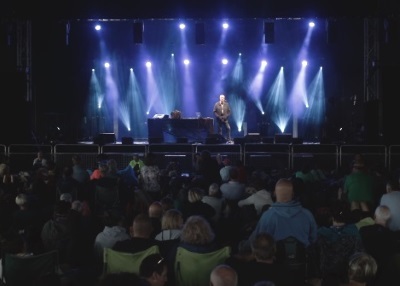 At WOMAD, the d&b Soundscape stage engaged audiences to deliver its part of the festival’s typically eclectic program over the long weekend. Hosting a diverse selection of international acts, the singer songwriters, bands, field recordists and DJs took the d&b Soundscape through its paces well into the small hours. By surrounding the audience with a loudspeaker system, the d&b Soundscape creates an acoustic environment in which people feel performances, real or abstract. The Soundscape delivers an aural perception aligned with what the eye sees, wherever the listener is within the audience. Soundscape and landscape linked in harmony, even with eyes closed.